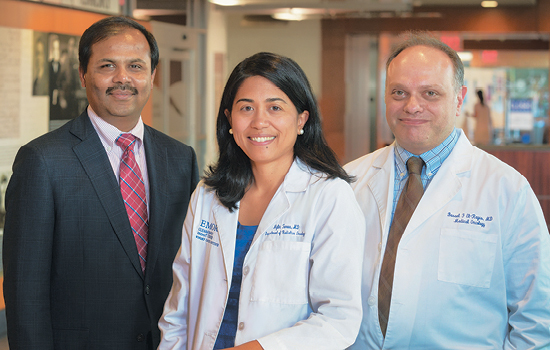 Winship Cancer Institute has named three key leaders to fill endowed positions. Suresh S. Ramalingam will hold the Roberto C. Goizueta Chair for Cancer Research; Mylin A. Torres will hold the Louisa and Rand Glenn Family Chair in Breast Cancer Research; and Bassel F. El-Rayes will hold the John Kauffman Family Professorship for Pancreatic Cancer Research. An academic chair or professorship recognizes extraordinary achievement and leadership and is invaluable for recruiting and retaining top faculty members. Endowment income from an academic chair contributes to the recipient's scholarly work and professional activities.